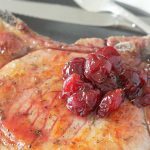 Thank you the Ohio Pork Council for sponsoring this recipe for Reverse Seared Pork Chops with Cherry Pan Sauce. As always all opinions are mine alone. Gone are the days of bone-dry, flavorless pork chops. Thanks to pork farmers and the stringent guidelines for raising happy pigs that they must adhere to, pork is now recommended to be cooked to 145 degrees. 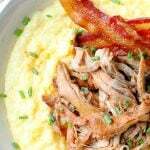 A blush of pink on your pork means a happy and juicy pork eating experience for you! The technique of reverse searing takes your pork to a whole new level of tender. I did some research and found that a quick dry brine, slow cooking in a 250 degree oven and searing in a hot pan with oil and butter are the keys to an out-of-this-world pork eating experience. 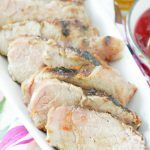 By topping that perfectly browned pork with a cherry and red wine pan sauce that is made in mere minutes I have a restaurant-worthy meal that can be made easily at home. It’s really kind of crazy-stupid that these pork chops taste this amazing but are so easy to make. 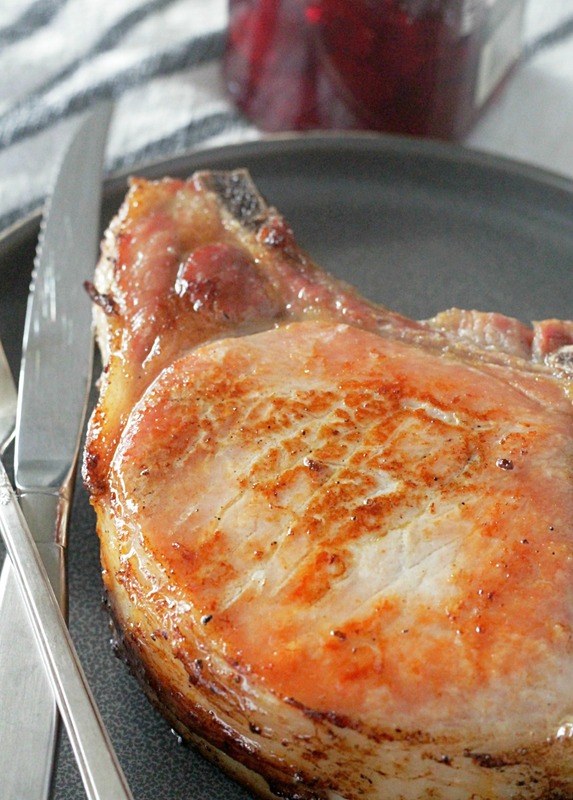 I chose to use bone-in pork chops because they looked so good at my grocery meat counter, but you can choose to use boneless pork chops instead if you prefer. Thank you so much for being a faithful reader and supporter of Foodtastic Mom. 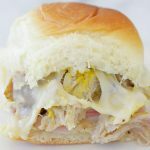 Be sure to PIN and print this collection of recipes! Evenly sprinkle both sides of the pork chops with two teaspoons of sugar and one teaspoon of salt. Allow to sit at room temperature for about 20 minutes. Pat dry both sides of the pork and preheat oven to 250 degrees. Place the pork chops on a sheet pan lined with parchment paper. Sprinkle the chops with an additional teaspoon of salt. Bake the chops on the center rack of the oven until the internal temperature reaches 130 degrees. This will take about 25 - 35 minutes, depending on how thick your pork chops are. Remove the chops from the oven. Heat one tablespoon of vegetable oil and one tablespoon of butter in a skillet over medium high heat. Brown one chop on both sides and the fat edge. Remove chop to a clean plate and repeat the process with the second chop. Reduce the heat to medium low and to the same skillet add the red wine and simmer for one minute. Stir in the the cherry preserves. Add the brown sugar and thyme, stir and remove from heat. 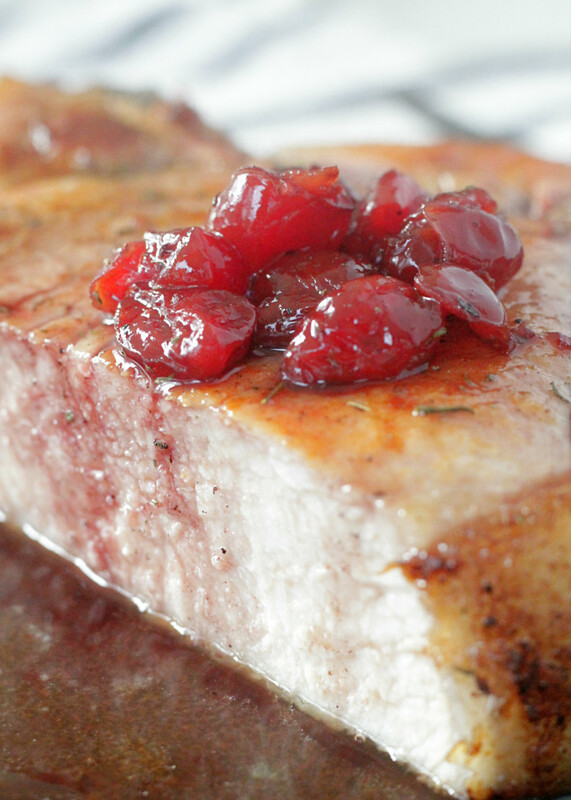 Pour the cherry pan sauce over the pork chops and serve. Nothing worse than bone dry and flavorless!!! These look amazingly juicy!! Woah, that cherry sauce sounds amazing! How great to use them in a savoury dish. These look beautiful. I love my pork cooked to the “hint of pink” temp. The meat is juicier. That cherry wine sauce gives a real wow factor! This looks like an awesome dinner. 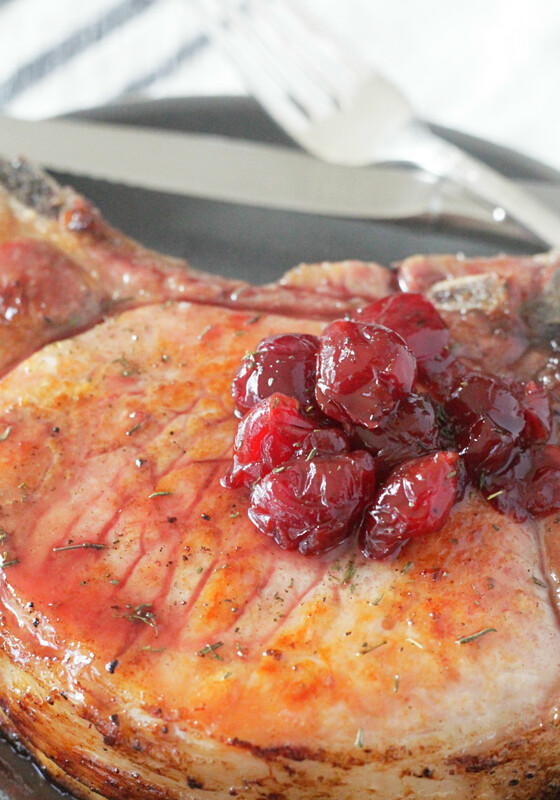 Pork and cherries is a great flavour combination. I would love this any night of the the week. These pork chops look so juicy!! Thanks for sharing!!! Wow this looks really incredible! I made the sauce as per recipe, except I used (jellied) Cranberry Sauce instead of cherries. Sauce and Pork were both perfect. Wonderful. So happy to hear this – and the adaptation!